As part of the research program a thermal imaging camera has been placed on Project Smartroof 2.0. Basis on ifrared radiation it registers the surface temperature of all objects in sight. The camera visualises (in colors we can distinguish..) the temperture differences between green and hard surfaces. 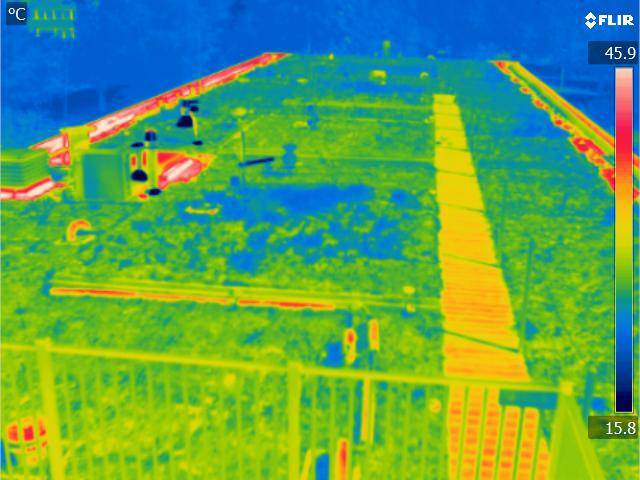 The image below illustrates planted areas with a temperature of around 20 degrees Celcius, while the black bituminous roofing materal at the edge of the roof heats up to over 45 degrees. The wooden walkway lihts up yellow, it heats up to tempertures higher than that of the planted areas. For comparison: the KNMI (Royal Dutch Metreological Institute) reported a 23 degrees average day with scattered clouds.